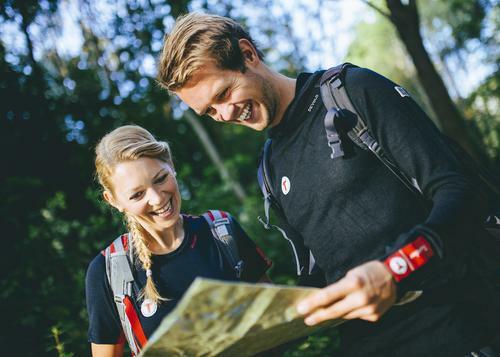 Topographic maps that show the details of terrain as well as trekking routes and lodging facilities are available for all of Norway in suitable scales of 1:50 000 to 1:100 000, with some detailed local maps in scales of 1:25 000. 1:50 000 maps are also available for GPS. It's best to buy a map before you depart for a hike or ski tour. The largest DNT local association, DNT Oslo og Omegn, serving the greater Oslo area, stocks trekking maps for the entire country at its shop at Storgata 3, Oslo, two minutes walk from Oslo Central station. You can order paper maps from the webshop, DNTbutikken. We will send it to you by post. Bookshops across the country also sell maps, but not all have all maps for the country. The staffed lodges that are open sell maps of their immediate areas, and the DNT key. Maps made specifically for trekking are best. The finer the scale of a map, the more details it shows and the lesser area it covers. A map in scale 1:100 000 is adequate for summer hikes on marked trails in most areas. These maps provide good overviews and are ideal for viewing surrounding terrain from a summit. Maps in scale 1:50 000 are best for use in steep, rough terrain, on glaciers and along routes where there are no trails. Maps of finer scale, 1:25 000 are available for a few areas and are best when there are many trails as well as for trekking away from trails. How can I find the best map to my trip? If you are joining a guided tour, you will find the best map of the tour in the trip description. If you are doing a tour on your own you will have to do some research. We have to main maps in 1 : 50 00 scale. Turkartserien and Norgesserien. You can search for the map at this webpages and then check if the map cover your area. If you click in to a map you can see an overview of the area. UT.no is our main planning webpage. We are sorry that it is all in Norwegian. We have to ask you kindly to use google translate until we manage to do the english version. Ut.no have information about wheather the cabin a staffed, selfserviced or unstaffed, opening hours, summer routes, winter markings, opening hours and much more. You will have to check every cabin you will visit at ut.no for updated information. If you would like to see a papermap at ut.no, it is possible to change it up in the right corner. In that case you can check distanse, hights and possibilities as if you had the papermap in front of you. Ut.no is also an app to your smartphone. You still can't find the perfect map? Send an email to turinfo@dntoslo.no and tell us about your trip and that you need help to find the correct map. It is very important that you tell us which cabin you are going to.